In 2009, Conan O'Brien will take over from Jay Leno as host of "The Tonight Show." In the year 2009, Conan O'brien will host The Tonight Show, whilst Jay Leno watches from his green house. In three years, HouseMan expects he will be a real man and a television star. 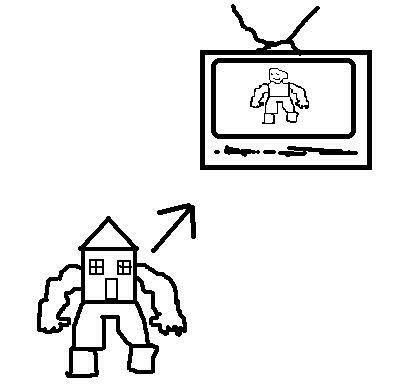 Television is the cause of House-Bot's poor self-esteem; "I wish I was a real boy and not just a house with limbs!" The romantic comedy on TV drove the lonely house to run away in tears. Apparently TV is one of the easiest things to convey in this game...what does that say about our culture, anyway? I love how all of the TVs (except the one in jbarba's lovely pic)have antennas. When was the last time you saw a TV with an antenna? Great pictures on this one!